I'm blogging from my phone again. This is going to drive Michelle mad because my formatting will be wrong and my picture sizes all over the place (if you don't notice anything wrong, it's because she couldn't bear it and fixed everything up, she's good like that!). It seems like ages since I last posted. 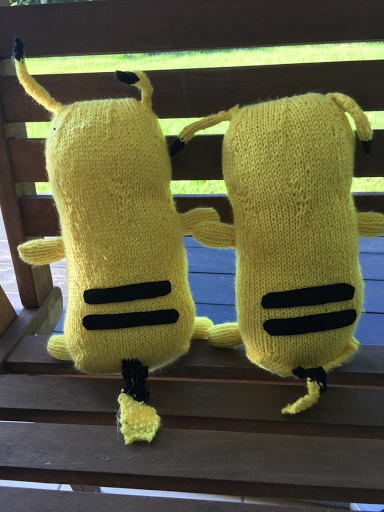 The lead up to silly season was crazy this year and despite having most of the knitting finished well before time, these guys were still considered a WIP right up until the night of the 24th. 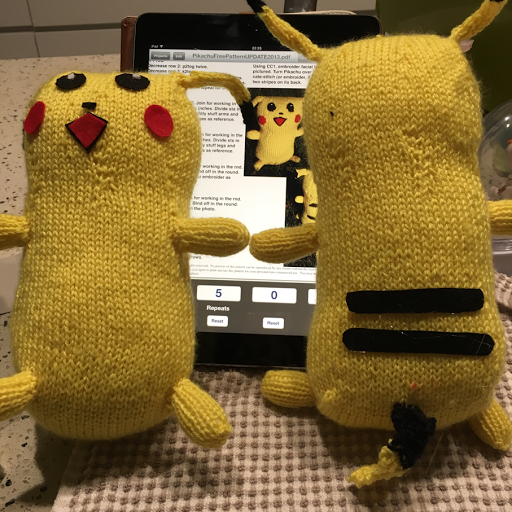 Link to pattern is back in this blog post. Another thing that Michelle would never do is, finish and gift a project ignoring a niggling suspicion that one detail is the wrong colour. 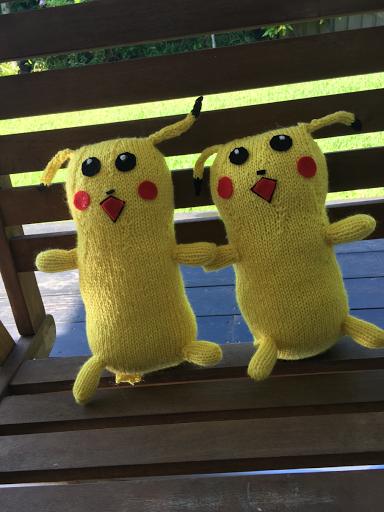 I however committed this crime against pikachus. Mr 8 whispered to me on Christmas morning "those black stripes are supposed to be brown but it really doesn't matter". I thought they were brown, I have brown felt, but when you are madly finishing an item on Christmas Eve rational thinking seems to go out of the window. The kids both love them. The dog covets them. Ha I think they look better with the black stripe! Watching your project with its Christmas Eve finish line reminds me of the year mum made us something for Christmas. I knew she was making something, she had to shut herself away for hours in the lead up. It turned out to be a framed quilted picture of bunnies baking for Christmas. It was a printed fabric panel kit that you back and stuff. I remember dreaming she was making me roller skates. My kids had no idea what I was up to. I'm obviously sneakier than your Mum! Rupert (the Dog) has managed to get to Flynn's and pulled his eye off so tonight I will be burning myself with a hot glue gun again.